Former Vice President Al Gore, newly named co-winner of the Nobel Peace Prize, said Friday he hopes the honor will "elevate global consciousness" about the challenges of global warming. Gore, whose documentary "An Inconvenient Truth," won an Academy Award earlier this year, was awarded the prize earlier in the day along with the U.N.'s Intergovernmental Panel on Climate Change, an international network of scientists, for spreading awareness of man-made climate change and laying the foundations for counteracting it. Shortly after the announcement, he pledged to donate his share of the $1.5 million prize money to the Alliance for Climate Protection, a bipartisan nonprofit organization that is devoted to changing public opinion worldwide about the urgency of solving the climate crisis. "This is just the beginning," Gore told reporters at a meeting of the group. "Now is the time to elevate global consciousness about the challenges that we face." Gore had been widely tipped to win Friday's prize, which expanded the Norwegian committee's interpretation of peacemaking and disarmament efforts that have traditionally been the award's foundations. "We face a true planetary emergency," Gore said. "The climate crisis is not a political issue, it is a moral and spiritual challenge to all of humanity." The Nobel committee chairman, Ole Danbolt Mjoes, asserted that the prize was not aimed at the Bush administration, which rejected Kyoto and was widely criticized outside the U.S. for not taking global warming seriously enough. "We would encourage all countries, including the big countries, to challenge, all of them, to think again and to say what can they do to conquer global warming," Mjoes said. "The bigger the powers, the better that they come in front of this." CBS News chief Washington correspondent Bob Schieffer said entering the race now would require Gore to overcome some substantial political obstacles. "The core of his support would have to come from that part of the Democratic Party that Hillary Clinton seems to have sewed up so far," he told CBS Evening News anchor Katie Couric. "The other part of his support would have to come from kind of the idealistic wing, that would be those voters that are for Barack Obama. I simply don't see him peeling off very much support from either of those two candidates and that would make it very, very difficult for him, it seems to me, to raise the money." Two Gore advisers, speaking on condition of anonymity because they are not authorized to share his thinking, said the award will not make it any more likely that he will seek the presidency in 2008. If anything, the Peace Prize makes the rough-and-tumble of a presidential race less appealing to Gore, they said, because now he has a huge, international platform to fight global warming and may not want to do anything to diminish it. As he left the room after making his statement, Gore ignored reporters asking if he planned to get into the presidential race. "Eight years of the Clinton presidency - and one bitter campaign in 2000 - have left the two power couples estranged and, perhaps, resentful," writes CBSNews.com senior political editor Vaughn Ververs. "Another eight years later, Hillary Clinton is riding high in her bid to win the Democratic nomination and Al Gore is an international superstar." Both Clintons, as well as several other presidential candidates and former president Jimmy Carter, made statements after Gore won the prize. "Al Gore has been warning and educating us about the dangers of climate change for decades. He saw this coming before others in public life and never stopped pushing for action to save our planet, even in the face of public indifference and attacks from those determined to defend the indefensible," former president Bill Clinton said. At the time, then committee chairman Gunnar Berge called the prize "a kick in the leg" to the Bush administration for its threats of war against Iraq. In response, some members of the secretive committee criticized Berge for expressing personal views in the panel's name. Mjoes, elected to succeed Berge a few months later, referred to that dispute on Friday, saying the committee "has never given a kick in the leg to anyone." The White House said the prize was not seen as increasing pressure on the administration or showing that President Bush's approach missed the mark. "Of course we're happy for Vice President Gore and the IPCC for receiving this recognition," Deputy Press Secretary Tony Fratto told CBS News. Fratto said Mr. Bush has no plans to call Gore. Gore, who was an advocate of stemming climate change and global warning well before his eight years as vice president, called the award meaningful because of his co-winner, calling the U.N.'s Intergovernmental Panel on Climate Change the "world's pre-eminent scientific body devoted to improving our understanding of the climate crisis." Eighty-four percent in the U.S. believe world temperatures are rising, according to a poll last month by The Associated Press and Stanford University's Woods Institute for the Environment. Yet while about seven in 10 said they want strong public and private action to help the environment, fewer than one in 10 said they had seen such steps in the past year. 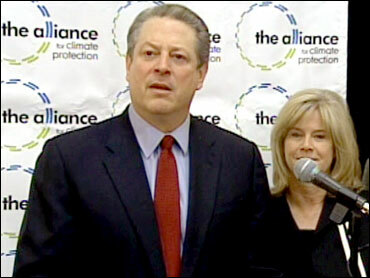 "Awarding it to Al Gore cannot be seen as anything other than a political statement. Awarding it to the IPCC is well-founded," said Bjorn Lomborg, author of "The Skeptical Environmentalist. Also, a British judge said in a ruling published Wednesday that some assertions in his documentary were not supported by scientific evidence. The case involved a challenge from a school official who did not want the film shown to students.